Five-time American League All-Star Nomar Garciaparra will attend the league’s 11th Hall of Fame induction ceremony on Nov. 20 at the Chatham Bars Inn, where he will receive the plaque that has awaited him since a scheduling conflict prevented him from coming to his own induction eight years ago. The Cape League’s Hall of Fame Weekend activities get under way on Nov. 19 when the inductees, their families, presenters and Cape League officials gather in Hyannis for a private dinner, followed by a group visit to the Hall of Fame & Museum, which occupies the lower level of the John F. Kennedy Hyannis Museum on Main Street. They will see their permanent plaques unveiled and be given a tour of the facility. The annual Hall of Fame brunch begins the following day at 10 a.m. in the main dining room of the Chatham Bars Inn, followed by the induction festivities at noon in the nearby Monomoy Theater. Boston media personality and Cape League broadcaster Scott Wahle returns as master of ceremonies. Celebrities expected to be in attendance include ESPN baseball analyst Bobby Valentine, NESN and MLBN analyst Peter Gammons and Fox News Channel personality Gretchen Carlson, co-host of the popular morning show, “Fox & Friends.” Ms. Carlson is the wife of inductee Casey Close (Harwich, 1984-1985). Tickets are $85 and may be ordered by sending a check to CCBL Hall of Fame Tickets, P.O. Box 266, Harwich Port, MA 02646. Garciaparra was inducted in absentia in 2002, but the plaque itself was never formally presented. Thanks to his decision to fly in for the induction of his close friend and former Red Sox teammate Lou Merloni, that bit of unfinished business can be resolved. When word of Nomar’s decision to attend reached Hall of Fame Chairman and CCBL Senior Vice President Jim Higgins, the 1993 Orleans Cardinals star was quickly added to the agenda. “We decided this would be the perfect opportunity to tie up some loose ends,” Higgins said. Garciaparra, now a baseball analyst for ESPN, retired last year. He was the Red Sox’s No. 1 draft pick in 1994 after leading the Orleans Cardinals to the Cape League championship the previous summer. He made his big league debut two years later, playing in 26 games. He won the Red Sox shortstop job the following spring, beating out another former Cape Leaguer, John Valentin (Hyannis, 1988), and quickly established himself as one of baseball’s premier players. "He's as good a young player as anyone I've ever seen come into the big leagues,” observed all-time Red Sox great Ted Williams at the time. “He's tremendous ---- one of the very best young hitters I ever saw. He's a smart kid and he knows all about hitting." Garciaparra batted .306 and hit 30 home runs en route to winning American League Rookie of the Year honors in 1997. He captured back-to-back batting titles in 1999 (.357) and 2000 (.372). He was named to five All-Star teams and became one of the most popular players in Red Sox history. As nagging injuries began to affect his performance, new Red Sox general manager Theo Epstein decided the team needed to boost its defense, and on July 31, 2004, just before the MLB trade deadline, he engineered a three-team deal that sent Garciaparra and minor league outfield prospect Matt Murton (Wareham, 2001-02) to the Chicago Cubs, while the Red Sox acquired two Gold Glove infielders, shortstop Orlando Cabrera from the Montreal Expos and first baseman Doug Mientkiewicz from the Minnesota Twins. Although stunned at the news, Garciaparra was philosophical as he packed his belongings and said his goodbyes. Injuries continued to haunt him and he was dealt by the Cubs to his hometown team, the Los Angeles Dodgers, after the 2005 campaign. In 2006, he was the National League’s Comeback Player of the Year, hitting .303 with 20 home runs and 93 RBI. He ended his playing career in Oakland in 2009, finishing with a lifetime .361 batting average, 229 home runs, 936 RBI and 1,747 hits in 1,434 games. 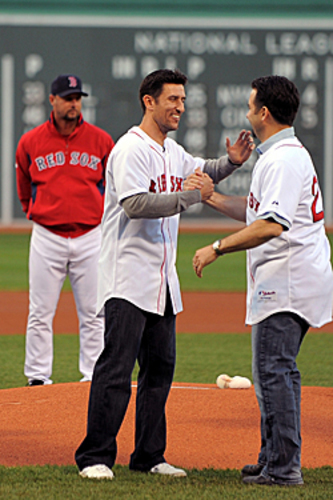 Last spring he signed a one-day contract with Boston so he could retire as a member of the Red Sox on March 10, 2010, at Ft. Myers, Fla. Three months later, “Nomar Garciaparra Night” was held at Fenway Park, where he received two grandstand seats from Fenway. One bore his familiar No. 5, the other No. 6, the number worn by his mentor Johnny Pesky, who made the presentation. Merloni was also there to greet him. Nomar is married to U.S. Olympic and World Cup soccer champion Mia Hamm. They are the parents of twin daughters, Grace Isabella and Ava Caroline.